I really like the writing style of Jason Reeser in this book of thirteen short stories, all of which are a delight. He brings poignancy to the people in their “new lives” in these cemeteries in New Orleans which makes compelling reading. I’ve always liked cemeteries and it’s certainly brought a new dimension to how I now view them, especially crypts. The scene is set with the opening words in the first short story, "The Wanting Dead":“My first night in the City of the Dead was a real eye-opener.”I can see the author's point here. It must indeed be quite a shock to find that you’re dead and then to meet others in the same situation.The book just got better and better after that.If I had to say which stories I preferred, they would be “The Unbroken Seal” as I felt so sorry for Paul and how he’d messed up his life before and, as a result, in death; Greta who was so generous in spite of everything in “The Rossi”; “A Night in the City of the Dead”: It all happens when Captain Lafitte decides that he “is going over the wall”; “Mugging the Dead” with Edward Williams was excellent but my favorite has to be “The Prophet” with the philosophical dead rock star, Teddy Oracle.It's just a wonderful collection of short stories. I still don’t know what makes a good book but I just know this is one of them.I highly recommend this book to all age groups. I was a First Read Winner of this book and I enjoyed reading it very much. I am not as eloquent as some people when it comes to reviews and for some reason I am having a real hard time expressing my thoughts. It reminded me of some of Edgar Allan Poe's work and it is just as thought provoking. All the characters are vivid and each short story delivers a new message. In my eyes Jason Phillip Reeser has made the Cemeteries in New Orleans more intriguing, I certainly could only walk though them in the daylight. I highly recommend this book. How to describe this book?It features an array of short stories and, while not all of them are horrific or scary, they all have death and cemeteries as common denominators. Some of them will make you think, others will make you worry but they all will surely strike that chord of "gosh, I'm going to actually die one day, maybe I should reevaluate my life choices while I still have time". But the moment is fleeting and easily forgotten as the story unfolds and the dead and the living stretch and cross over their respective boundaries.A nice read. i was given a copy of Cities of the Dead from the author to read and review..... this is a compile of 13 shot stories all taking place in a Cemetery in New Orleans . you are introduced to each of the characters and you get to hear their stores you also get to read how they interact with each other in the Cemetery... it was an interesting book it was a change from what i normally read and i did liked it. 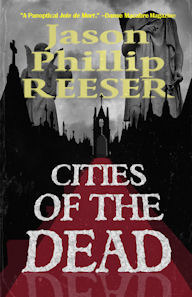 would i recommend Cities of the dead? yes i would. I really liked the way this book was written. It is a series of short stories written from a ghost's point of view. Some regretted things they did in life such as isolate himself and others were just happy to have died with their spouse. Such creepy little tales and yet they warm your heart. Props to Jason Philip Reeser and his book. Some of these stories were more interesting than others, but I just couldn't get into them that much. Not much of a ghost type guy though, so that didn't help. Free from Amazon at some point so picked it up and read it. Didn't bother finishing it. Found getting into it harder and slower than I'd expected. First story seemed really vague and extremely boring to me. Might revisit it later when I've got nothing better to do. When I started reading it felt like I was in the middle of a story by Edgar Allan Poe but wait, the time frame is wrong. I wish I had read this book around Halloween. Ordinarily, I am not a fan of short stories but I really liked these because they had a common thread that held them together. I tried to get into the stories but I just couldn't. They didn't interest me and I had to finally give up on them.